Companies launching into new markets often spend substantial budgets on advertising and PR in order to create awareness. These investments can be significant when there is no existing affinity between the brand and the solution in target markets. For example, Orange France faced this challenge when launching Homelive, a connected home management platform for IoT devices. Turning to their influencer marketing platform, Traackr, the company identified and engaged influencers in new communities outside of high tech and marketing to include lifestyle design and connected home. These influencers were engaged to create reviews on their blogs and inspire social traffic. The result was over 20,000 unique visitors per day on the campaign website along with 14,000 social mentions, a majority share of voice on social media, and first-page visibility on Google on important keywords. The program was successful not because of overspending on ads and PR, but because of integrating specific and relevant influencer communities with content marketing. Launching into new markets can be an uphill battle to create brand awareness, credibility, and engagement and is a common challenge with companies worldwide. In addition to the costs associated with sophisticated advertising and PR campaigns, increasing consumer demand for quality content in combination with distrust of branded content and advertising has senior marketing executives looking for options. From the promise of increased consumer trust to better conversion rates and retention rates, content co-created with industry influencers is an attractive approach for many brands that are challenged to keep up with content quantity and effectiveness. According to research by TrackMaven, over the past two years output of content has increased by 78%, but content engagement has decreased by 60%. In fact, there’s a lot to be optimistic about for senior marketing executives who are considering an influential approach to content marketing. Some 82% of consumers surveyed would follow recommendations from influencers, according to a study by Dr. Johah Berger from the Wharton School, while a study from Burst Media reports an average of $ 9.60 earned media value for every $ 1 spent working with influencers. Both B2C and B2B marketers can benefit from an influencer-focused approach to content marketing. Instead of viewing influencers as shills for conference tweets or simply as industry celebrities for publicity, CMOs can approach influencer relationships as a content partnership that provides mutual value. But how? There are a myriad options when it comes to influencer content programs, but many of these efforts can be segmented into three use cases. 1. Micro-content: These are often short-form content contributions including quotes, tips, or insight from individual influencers that are added to brand content assets. A great example of micro-content application would be LinkedIn’s now famous Sophisticated Marketers’ Guides championed by Jason Miller, group manager of global content and social media marketing at LinkedIn. The first edition included short-form contributions in an “ask the expert” format and as pull quotes included in an ebook, webinar, and infographic and translated into several languages. The first Sophisticated Marketers’ Guide resulted in over 10,000 downloads, 3,000 MQLs, and a staggering 21,000% ROI. 2. Campaigns: Longer-form content contributions by a group of influencers, often as part of a larger campaign. Traackr recently published a good example of influencer campaign content, aptly named “Influencer Marketing in Real Life,” by co-ordinating an event and subsequent content with major brand executives and industry influencers. Contributors including executives from Cisco, Marriott, and Dell were interviewed along with industry influencers including Joe Pulizzi, Ann Handley, and Jay Baer by email and phone, and were also engaged in person at an event during an industry conference for professional photos. Over 50% of the content for the campaign was created by participating influencers and the ebook beat benchmark download goals by 1,883%. 3. Community: Brands that can commit to influencer engagement and see the value of ongoing relationships will identify and activate a dedicated group of influencers who participate in a mix of scenarios and contribute a variety of short and long-form content. Phillips implemented a digital command center that leveraged social media monitoring, content creation, engagement, and analysis to monitor and engage three key groups of influencers. It wanted to “own” and influence conversations around important topics including clean air; smart home; look good, feel good; ageing well; and connected work spaces. Engaging with influencer communities around each conversation, three types of content were co-created including long-form content, editorial, and social content. The program expects to have 4,000 to 5,000 pieces of content created per conversation area. Senior marketing executives who think about influencers as partners and participants in the brand conversation with customers can tap into an incredible resource that offers mutual value to both the brand and the influencers. By activating influencers to co-create content and amplify it to their respective audiences, brands can extend their reach to new customers in a credible way that can inspire relevant conversation, purchases, and advocacy. When CMOs increase their marketing organization’s ability to plan and implement integrated influencer content programs, the result is not only an increase in quality content that customers actually want to engage with, but qualitative relationships with the influencer participants. A version of this article originally appeared on CMO.com. Disclosure: LinkedIn is a client of TopRank Marketing. 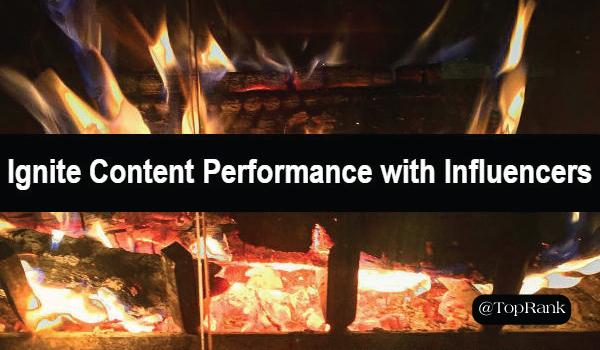 The post 2017 Trends for CMOs: Ignite Content Performance with Influencers appeared first on Online Marketing Blog – TopRank®.